Micromanipulator design at Sutter Instrument began in 1985 with the MP-85, a refined and extended Huxley- style micromanipulator. From that time on, the Company has continued to develop manipulators with stepper-motor drive mechanisms and ergonomic controllers that are adaptable to many different experimental designs and platforms. This design process has yielded multiple motorized manipulators, the industry standard MP-285, the MP-225, the narrow format MP-265, Xenoworks® microinjection manipulators and the four axis QUAD®, and the three-axis TRIO®. Researchers performing complex experiments are now able to control multiple motorized manipulators with the MPC-200 controller. This controller is capable of operating any 2 of our three axis motorized manipulators and can be expanded to run 4 manipulators off a single ROE-200 input device. This highly flexible solution allows the user to add components to their system as needed. The newly designed QUAD®, has a motorized fourth axis in addition to the X,Y, and Z axes, to move the pipette coaxially at the desired angle. This choice is perfect for users that need a true diagonal. The compact ROE and controller-in- one is easy to use, has built-in robotic capabilities and a USB port to program more complicated moves. The TRIO® utilizes the lead-screw design of the QUAD in a more traditional three- axis micromanipulator. The TRIO may be configured in either an XYZ configuration (MP-245) or it may be configured with an XY-Diagonal configuration (MP-235). The TRIO controller is uniquely capable of synthesizing a diagonal or Z-axis on the respective manipulators giving both true 4-axis capabilities. As time has shown, much of what makes a device popular is how easily it can be incorporated into an existing set-up. In the case of micromanipulators, this process has involved designing manipulator platforms that bolt directly to the frames of the most popular microscopes. Alternatively, Sutter also offers rock-steady, free-standing platforms that support the manipulators by clamping to the table beside the microscope. Our MT-70 stand, originally designed for stable support of the fifteen pound Huxley manipulator, and MT-75 gantry-style stand are perfect free-standing platforms for our manipulators. 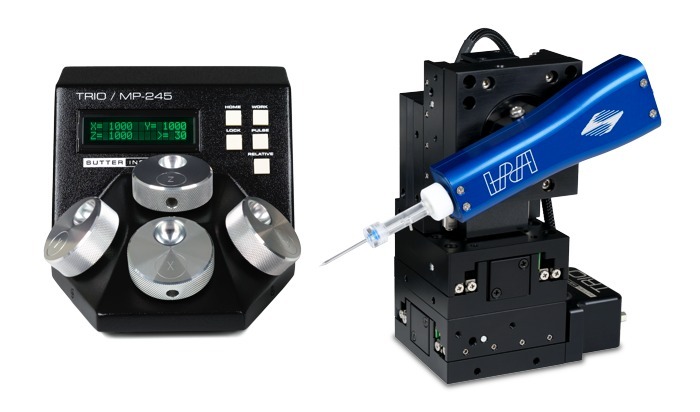 We have also designed the MD series microscope-specific platforms that bolt directly to the bodies of the most popular Leica, Nikon, Olympus, and Zeiss inverted microscopes. These platforms lend themselves to the low-drift recording configuration required when using Sutter manipulators for positioning patch-electrodes onto attached cells in culture. The 3DMS, 3-Dimensional motorized stage, was designed for experiments that require rapid movement of a chamber or culture dish to multiple locations in a compact space. Two axes provide X-Y translation and the third axis provides built-in focusing with sub-micron accuracy. The 3DMS offers robotic programmability of complex motion sequences when used with the MP-285 controller. A task specific platform for manipulators is the MT-1000 translation system. When coupled with MP-285 or MP-225 manipulators, the system forms a slice-patch workstation. The MT-1000 was born out of a technique now common in slice recording that moves the optical pathway while keeping the slice chamber and recording electrodes fixed. The translation system allows the user to move to multiple locations on the tissue at high resolution without disturbing recording electrodes. The MT-1000 workstation encompasses: an X-Y translator designed to move a microscope smoothly and accurately; two MT-75 gantry-type stands for positioning manipulators on one or both sides of the microscope; and a third gantry stand that becomes the fixed support for the chamber. The MT-2000 uses a motorized X-Y translator. In this design, stepper-motor driven lead screws provide smooth movement of the microscope. Sutter'slarge motorized platform stages, the MP-78 and MPC-78, are perfect for multisite experiments where the microscope cannot be translated and a wide field of view is necessary. The MT-78-FS large fixed-stage platform provides the same generous mounting surface for experiments dependent on XY translation. Rounding out our company's line of manipulators is the MM-33 manual micromanipulator, an economical micromanipulator of sufficient resolution and control for impaling xenopus oocytes and other medium-fine manipulation tasks.